It is our great pleasure to welcome you to the 8th Multidisciplinary Musculoskeletal Ultrasound Congress on Pain Management (MSK US PM) 2018 in Hong Kong. With the theme of “When Clinicians Meet Scientists”, this year the Congress is jointly organized by the Hong Kong Society of Musculoskeletal Pain (HKSMP) and Multidisciplinary International Association of Musculoskeletal Pain (MIA). MSK US PM is well known to have the uniqueness of combining Clinical and Academic Experts from both Musculoskeletal Ultrasound Applications and Ultrasound for Pain Management. The Congress is an excellent opportunity to gather clinicians and scientists, to share clinical experiences and latest advances with more than 50 multidisciplinary in international opinion leaders & local faculty members, allowing exchange in clinical experience in State of the Art field of Rehabilitation Science, Sports Science, Pain interventions , Musculoskeletal and Pain medicine, using Ultrasound as Point of Care tool for Diagnosis, monitoring and treatment guidance . This year we have Pre-congress Refresher Course, Hands-on Cadaveric Sonoanatomy Workshop, Town Hall Debates and to end with Master Class. The Cadaveric Sonoanatomy Workshop is specially co-organized with the Hong Kong Society of Rheumatology, with EULAR Musculoskeletal and International Multidisciplinary Faculty to give lectures and teach us on hands-on dissections workshop. With our prior International Faculty from different specialties over past 8 years since 2010, we share a common vision in getting a better MSK pain management with brotherhood from different disciplines and meet annually for sharing clinical pearls and consensus. We expect more guidelines and learning platform to be post on MIA website after this year’s sharing. We would like to specially thank the dedicated work of the Organizing Committee for their amazing collaborative work. I would also like to thank all the Overseas and Local Faculty to spare their precious time to come to support this congress. Special acknowledgements to the Supporting Organizations and Healthcare Industry Partners. Welcome you all to this fully-packed, innovative and unique Congress in Hong Kong! 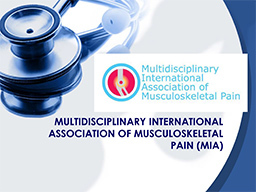 And we are looking forward to a bigger International Congress on Musculoskeletal Pain on 6 – 8th December 2019.